Victoria Jaiani, Dylan Gutierrez and Fabrice Calmels lead an outstanding ensemble for opening night in the Auditorium Theatre of Roosevelt University. 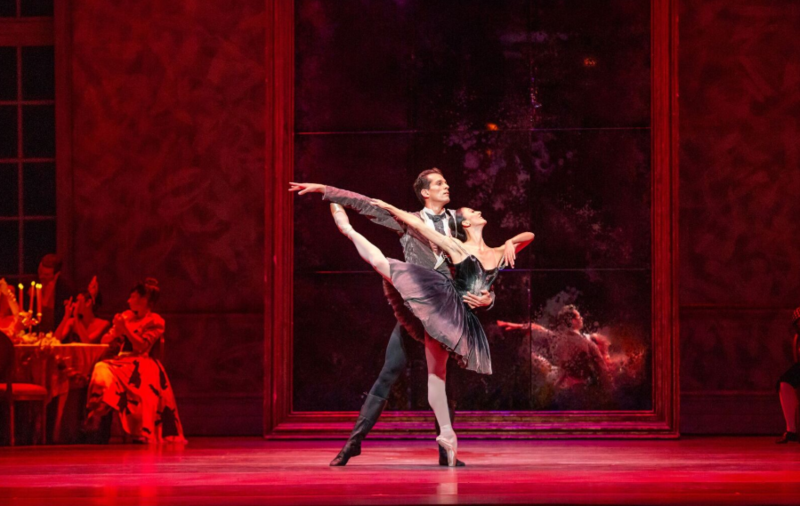 In Christopher Wheeldon’s “Swan Lake”, the Principal Dancer’s (Gutierrez) vivid imagination seemed more like reality than fantasy. While he envisioned his dance company’s future performance of “Swan Lake”, the audience was whisked away into the fairytale realm where a Prince meets a bevy of swans with a supernatural secret. The Dancer genuinely fell in love in the pretend world with the lovely swan queen (Jaiani), and that remarkable fantasy began to merge with his reality. In real life, the Dancer was drawn to a beautiful ballerina at the evening gala, because she reminded him of the swan queen in his dreams. The Principal Dancer and swan queen were front and center for many of yesterday’s scenes. 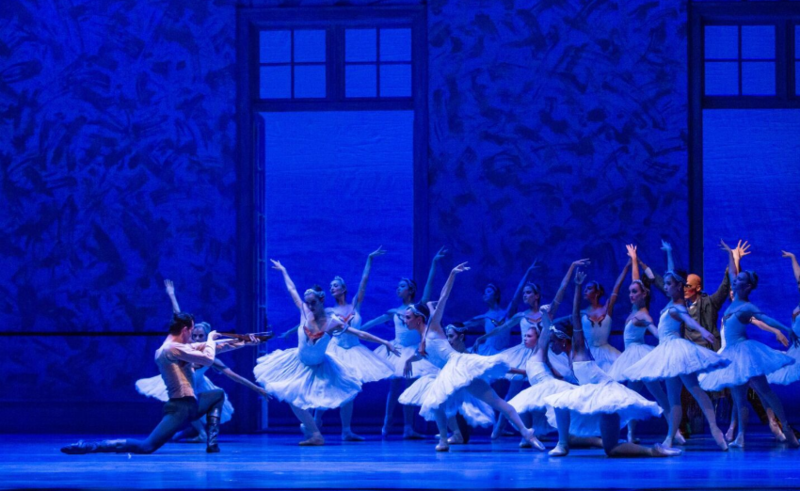 They were surrounded by a sea of gifted dancers who portrayed swan maidens and fellow dancers in the studio. The Patron (Calmels) was absolutely terrifying as the fantasy realm’s Van Rothbart. He made you believe he was truly evil by his sinister moves and dramatic makeup. He did an amazing job. 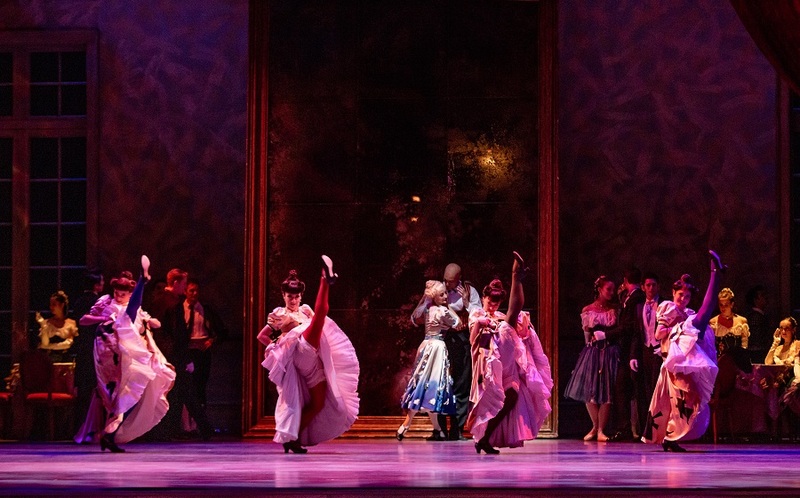 Scenes to anticipate in Christopher Wheeldon’s version are the swan maidens’ lively first appearance and the evening gala. The variety of dance styles in the latter slightly remind you of the classic “Nutcracker”. The Russian Dance, Spanish Dance, Czardes and Can-Can gave ballet lovers a good introduction to dance diversity around the world. You can’t help but feel “Winning Works” came early this year. “Swan Lake” runs at the Auditorium Theatre of Roosevelt University in Chicago, IL through October 28th. A Special Thanks to The Silverman Group for the press passes and photos. This entry was posted in Entertainment, Reviews, theatre and tagged Ballet, dance, Dylan Gutierrez, Fabrice Calmels, Victoria Jaiani. Bookmark the permalink.